The Battle of Tarakan took place on January 11–12, 1942. 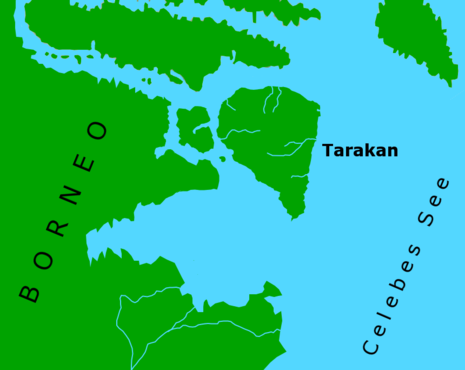 Even though Tarakan was only a small marshy island at northeastern Borneo in the Netherlands East Indies, but the 700 oil wells, oil refinery and airfield on it, was one of the main objectives for the Empire of Japan in the Pacific War. It is interesting that one day earlier, Japan just declared war on the Kingdom of the Netherlands on January 10, 1942; although the combat had taken place in the surrounding area about one month and Queen Wilhelmina from the Kingdom of Netherlands had declared war on Japan on December 8, 1941. On January 10, 1942 a Dutch Dornier Do 24K flying boat spotted a coming Japanese invasion fleet and knowing the winning chance was small, the Dutch Commander ordered the destruction of all oil fields on the island. The Japanese forces of the Right Wing Unit from the Sakaguchi Detachment landed on the east coast of Tarakan at midnight on 11 January 1942, followed by the 2nd Kure Special Naval Landing Force. After mounting a brief, but fierce resistance, the Koninklijk Nederlands Indisch Leger (Royal Netherlands East Indies Army, or KNIL) garrison was outnumbered and surrendered in the morning of January 12. All prisoners of war were executed by the Japanese in retaliation for the destruction of the oil installations; a feat that was repeated later in Balikpapan. During the night of January 11, before Japan completed the blockade of Tarakan, the Dutch submarine K-X, the patrol boat P-1 and the civilian motor launch Aida slipped away. The Dutch minelayer Prins van Oranje tried to escape as well but was sunk by the Japanese destroyer Yamakaze (Lt. Cdr Shuichi Hamanaka) and the patrol boat P-38. Tarakan remained under Japanese occupation until May 1945 when it was liberated by Australian troops in the Battle of Tarakan.